The Netherlands are full of historical organs. Then why does Tactus release a disc with recordings of an organ which is less than 50 years old? There is a good reason. The building of the transept organ in 1964 in the Oude Kerk in Amsterdam was groundbreaking, at least in the Netherlands. It was the reconstruction of an instrument built in 1657 by Hans Wolff Schonat which replaced the one Jan Pieterszoon Sweelinck had played when he was the organist of the Oude Kerk. In 1821 the pipes - some of which Schonat had taken over from Sweelinck's organ - were all taken out; some of them have found their way into another organ elsewhere in the Netherlands. Today the building of an organ after models from the 17th or 18th century is common practice, but in the 1960s this was a relatively new concept. One of the key figures was the German organ builder Jürgen Ahrend who was also responsible for the reconstruction of this organ, and who already had some experience in this department. Fortunately a list of stops was available. It was included in a book published in 1774 by the German-born organist Joachim Hess. This was used to reconstruct the disposition of the organ. Ahrend made faithful copies of old pipe-work. Other parts of the organ were reconstructed on the basis of his vast knowledge of 17th-century organs. In 2002 the tuning of the organ was changed into mean-tone temperament. This recording consists of two parts. The first three items are from an old recording by Gustav Leonhardt before the change of temperament, whereas Matteo Imbruno recorded his part of the programme afterwards. The date of Leonhardt's recording is not given. It is likely the original tape has not been preserved. Listening with a headphone I heard some noises which suggest to me that the recording was copied from a vinyl disc. The differences between the two temperaments are also noticeable - depending on the music chosen - for instance in the last variation on Psalm 23 by an anonymous composer and in Scheidemann's Erbarm dich mein, o Herre Gott. The programme centres around Sweelinck who played a key role in the development of keyboard music in Europe. He adopted composition techniques from various regions in Europe, developed and adapted them and passed them over to his many pupils. In particular many young organists from Germany went or were sent to Amsterdam to study with him. His influence is clearly noticeable in the oeuvres of, for instance, Heinrich Scheidemann and Samuel Scheidt. Sweelinck adopted the variation technique of the English virginalists and extended it to the pedal in pieces on sacred melodies. Likewise he used the Italian form of the toccata. A number of his toccatas have pedal parts, because in contrast to Italian organs most Dutch organs had pedals. 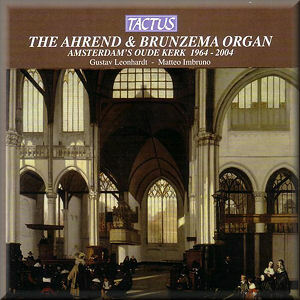 Another feature of Sweelinck's keyboard oeuvre is his use of the echo technique, reflecting the possibilities of his own organ in the Oude Kerk which had three manuals and pedals. The echo technique is also frequently applied in the oeuvre of his pupils. This disc includes some pieces by anonymous composers. Whether these were pupils of Sweelinck is impossible to say, but their compositions clearly show his influence. Anthoni van Noordt was one of the most important organists in the Netherlands of a later generation. His variations on Psalm 50 are from his only collection, with fantasias and psalm arrangements. These are still close to the style of Sweelinck. It should be noted that most organ music in the Netherlands by Sweelinck and the next generation was not intended for liturgical use. It was only later in the 17th century that the organ started to be used to accompany the congregation. Before that it was silent during Sunday services. Organists were employed by the city council and were required to play before and after services and to entertain people on weekdays. Gustav Leonhardt's recording may be a bit under par in regard to recorded sound but his performance is excellent, very rhetorical and well articulated. Matteo Imbruno, of Italian birth but attracted by the Netherlands and its music and now living there, is his equal. The variety in his registration offers the possibility to become acquainted with the rich range of colours of this organ. The booklet contains notes on the history of the organ and a disposition and picture of the organ as well as biographies of the artists in Italian, English and French.